1) Q: This painting tells its story through the pictorial device of continuous narrative, in which successive episodes in the story are depicted together in a single picture with some repetition of figures. A: Summarize the narrative for students by guiding them through the painting. For background information, you may wish to consult the Evidence Sheet: The Martyrdom of Saint John the Baptist (see Activity: Analyzing a Narrative Painting). 2) Q: Why do you think the artist chose to use continuous narrative rather than a monoscenic (single moment) approach limited to a single moment in the story? A: There is no single correct answer, but students should recognize that each episode contributes to an increasingly dramatic, if horrifying, tale. 3) If you had to delete one of the events in the picture, which would it be? Why? How would that affect the narrative arc? How would it affect the visual impact of the picture? 4) How might you paint this narrative using a monoscenic (single moment) approach? 5) Q: What techniques did the artist use to distinguish the separate episodes from one another? A: He distinguished the episodes through the relative size and placement of figure groups and the physical boundaries created by architecture and furniture. 6) Q: How did the artist show that the episodes are connected? Hint: Consider his use of visual repetition and patterning to connect Salome, the executioner, John the Baptist, Herodias, and Herod. A: Salome and executioner: They appear as mirror images, both dressed in blue and gold, raising an arm overhead and stepping forward onto one leg. Salome and Saint John the Baptist: John assumes the same kneeling posture that Salome adopts as she presents the prophet’s head to her mother. 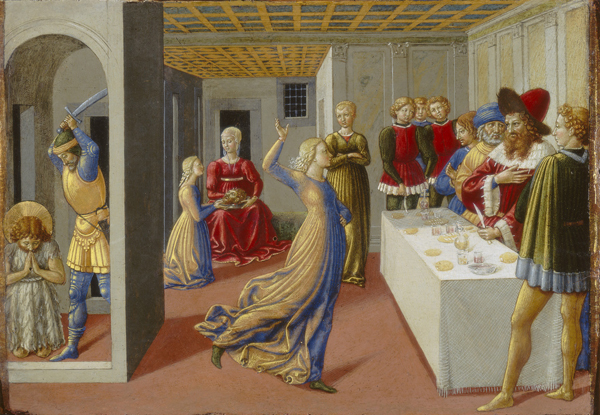 Herodias and Herod: Both are dressed in crimson and white. 7) Q: What thematic or narrative significance might these connections have? A: Visual similes enhance narrative cohesion, strengthening the interrelationship of incidents. The connections also help move our eyes through the composition. In particular, the doubled figure of Salome in both foreground and background establishes a direct connection between the beginning and end of the story.